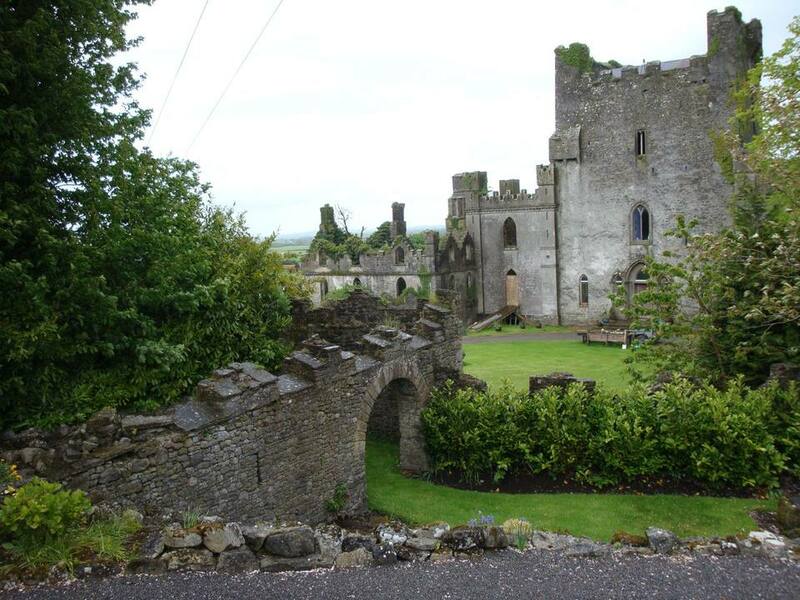 Leap Castle in Ireland’s County Offaly has a tantalizingly haunted history. From deathly trapdoors to dreary dungeons, the castle is known to be one of the most haunted homes in Ireland. Curious to learn the ghost stories and visit for yourself? Here is the complete guide to Leap Castle. There is some disagreement about when the tower of Leap Castle was first built, with some claiming it was erected in the 1250 and others insisting that it was only constructed in the 1500s. While there is no single answer, it is well accepted that the fortified tower house was built upon a much earlier settlement site which dates back to the Iron Age. The best-known history of Leap Castle begins in the 16th century when it was likely built by the O’Bannon clan. The castle was then known as Leim Ui Bhanain or “Leap of the O’Bannons” because legend has it that two O’Bannon brothers who were competing to lead the clan agreed to a leap to decide who would hold the power. The brothers jumped off the rocks where the castle was going to be built and the brave survivor went on to become chief. The O’Bannons, however, were what is known as secondary chieftains, and true power belonged to the terrifying O’Carroll clan. The O’Carrolls took over control of Leap Castle and often used it to stage massacres of rivals and even to kill each other. The castle passed between O’Carroll heirs as they murdered their dinner guests and their own soldiers, and were then killed by power thirsty kinsmen. It is said that the ghosts of the victims still haunt Leap Castle today. In 1922, Leap Castle was set on fire and destroyed during the Irish Civil War. The castle was abandoned until 1974 when it was bought by Peter Bartlett, an Australian descendant of the O’Bannon clan. He began restorations on the castle until his death in 1989. The castle was then purchased by Sean and Anne Ryan. It is still privately owned, with the Ryans continuing the restoration work on Leap Castle to this day. Leap Castle is now a private home so it is not possible to visit all of the structure. However, the Ryans sometimes grant permission to explore some of the upper floors that are still in ruins. The most interesting "attraction" to try to see at Leap Castle are the ghosts. It is often called “the most haunted castle in Ireland,” thanks mainly to the bloody history of the O’Carroll clan. For a taste, ask to see The Bloody Chapel, where one-eyed Teige O’Carroll murdered his brother while he was leading a family mass. After the castle was destroyed in 1922, repair work uncovered a hidden dungeon filled with corpses. It is thought that victims may have been tossed here through a hidden trapdoor. An exact count of the bodies was never determined but it took three carts to take away all of the human bones. Supernatural hunters should keep an eye out for the many ghosts who are thought to haunt the property, including the spirits that owner Sean Ryan claims to have met personally. There is a lady in red who wanders the castle holding a dagger and crying for her murdered child, and the ghostly spirits of two little girls who are believed to have lived at Leap Castle in the 1600s. Leap Castle is located in County Offaly, Ireland, just outside of Coolderry and is privately owned by musician Sean Ryan and his wife, Anne. The pair live in the castle while also continuing to repair and restore the building. He claims that the spirits that he and his wife see really do exist, and is usually happy to share his knowledge of history and open the grounds to self-guided tours. In order to visit Leap Castle, it is best to be in touch with Sean directly via email to confirm availability and the best time to stop by. Please note that there is a 6 euro donation requested in order to support the upkeep of the unique castle home. For more famously haunted castles, stop by Charleville Castle. The Gothic-style castle has a creepy past and is not far from Tullamore. Birr Castle is also located in the same county. While it does not have any ghost stories, it does have science exhibits for children. The county town of Tullamore is most famous for its local whiskey, Tullamore Dew—a favorite Irish drink. For a more natural escape, head to the nearby Slieve Bloom mountains.